It’s time for another look through my old map collection, and this time I thought I’d finally get round to the map that actually inspired me to start this blog in the first place. On the front cover, it looks just like a normal petrol station road map, illustrated with generic tourist images (just so you know you’re in London, there’s Tower Bridge, a Beefeater, and a Routemaster bus). The back cover shows the coverage of the series. 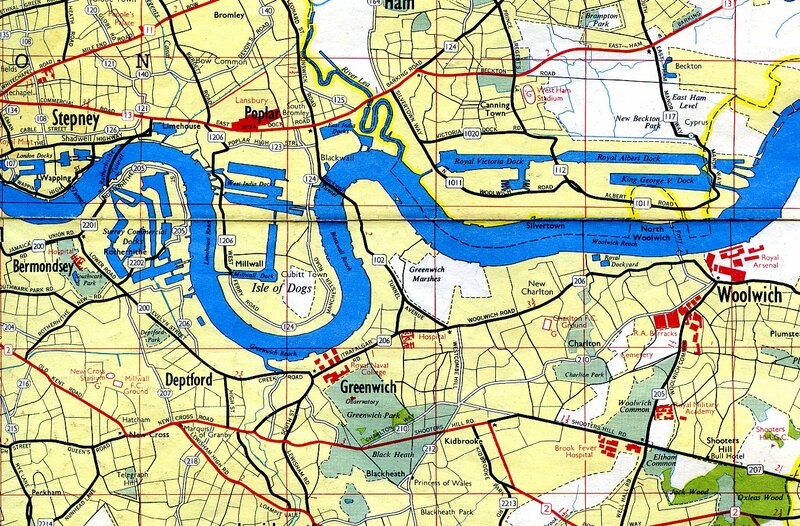 London is the only city that has been mapped in detail – the other sheets seem to be smaller scale touring maps. Looking inside is when it gets interesting, though. 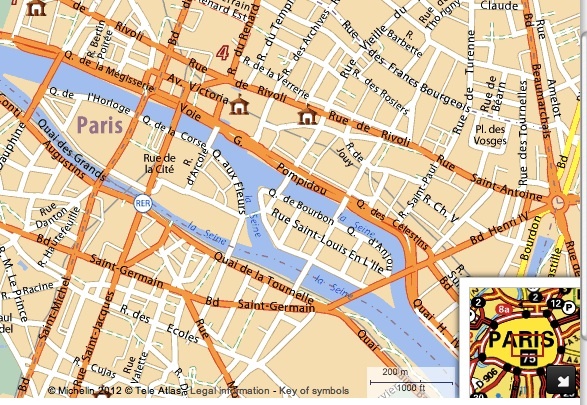 Street maps are generally produced in two styles – cased street symbols and centred labels, as seen on European-style street maps, or North American-style maps where labels are offset from thinner, single street features. 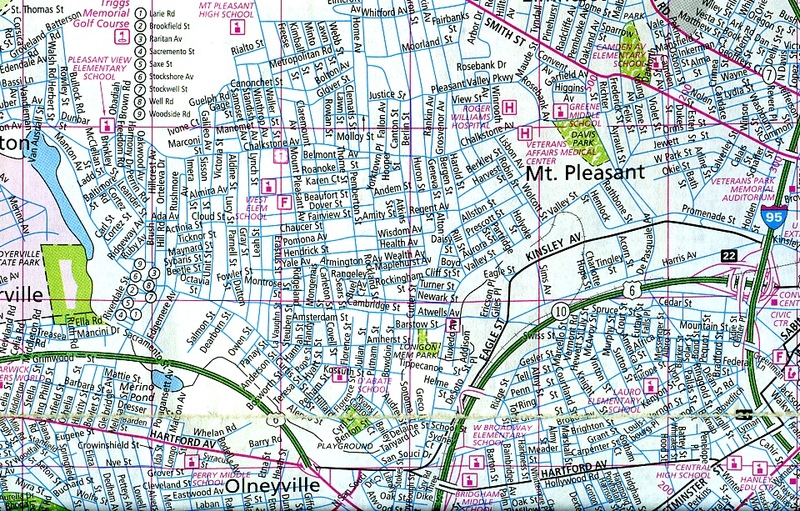 The former style is prevalent among web maps from across the world, as I couldn’t find an online example of streets with offset labels. 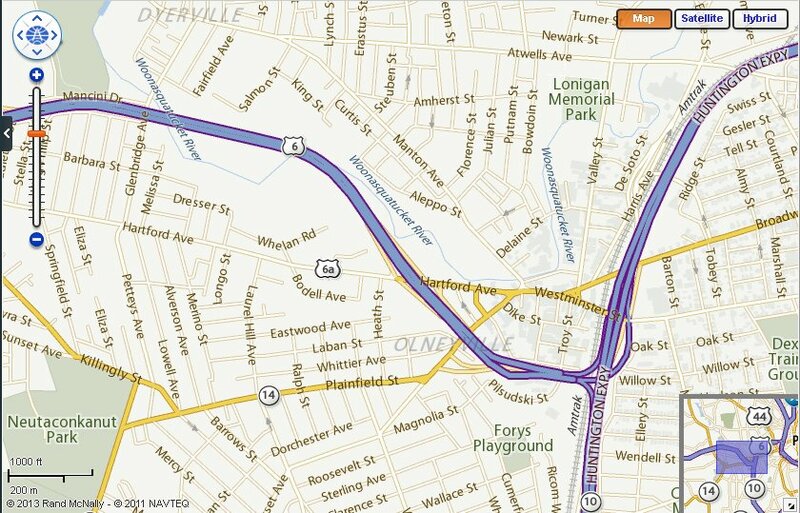 See below for a print map excerpt from 2000, with the same area on a web map. This London map is different though; it is a map of Europe, but done in the North American style. I’ve never seen a British street map that looks like this before. When you look closely at the labelling, there are a lot more interesting details. It has clearly been done by hand, as the spacing and font sizes are quite inconsistent. 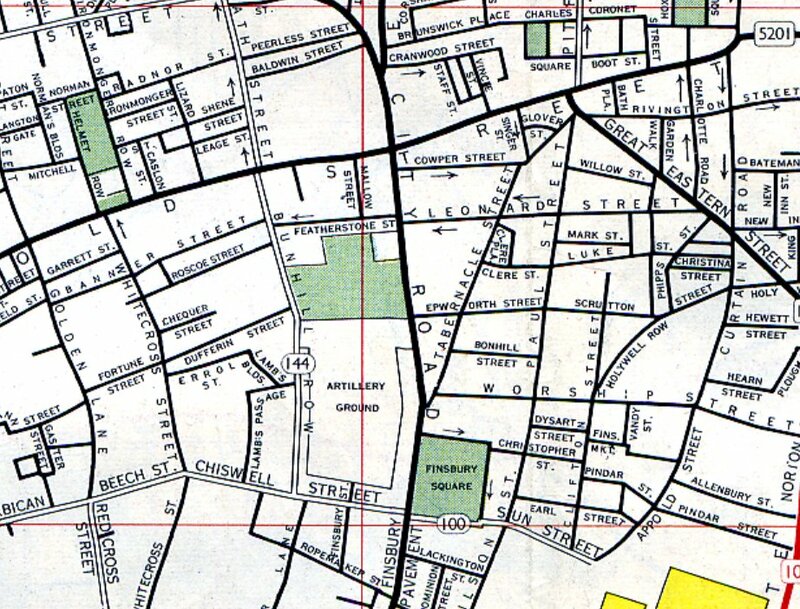 For example, Brushfield Street has been broken up so the letters don’t overlap the street underneath, but Artillery Lane is evenly spread along the street, with some letters clashing with the side streets below. On Bishopsgate, however, the underlying features have been broken, so the label is surrounded by white space. The Houndsditch label has also been spaced out, with other labels placed in the spaces. On example 2, more labels have been squeezed into the spaces between the characters of Monument and King William Street. You can see text going right up into the Ls of William. 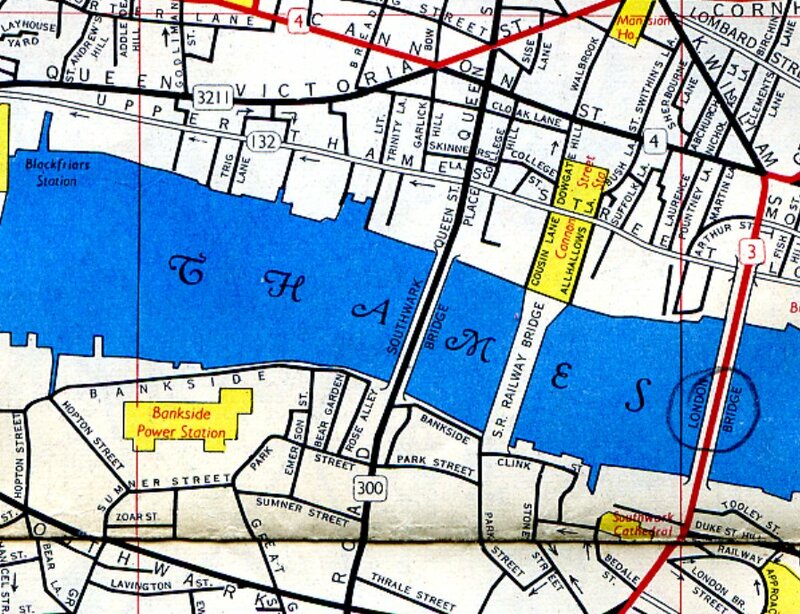 Example 3: again, Upper Thames Street has been stretched along the length of the feature, with other labels in the spaces. Note also, Bankside Power Station, or, as it is known today, Tate Modern. Marshalsea Road, on example 4, has more feature masking. Example 5 shows how the junction at Holborn Circus is masked, but Ludgate Circus is not. 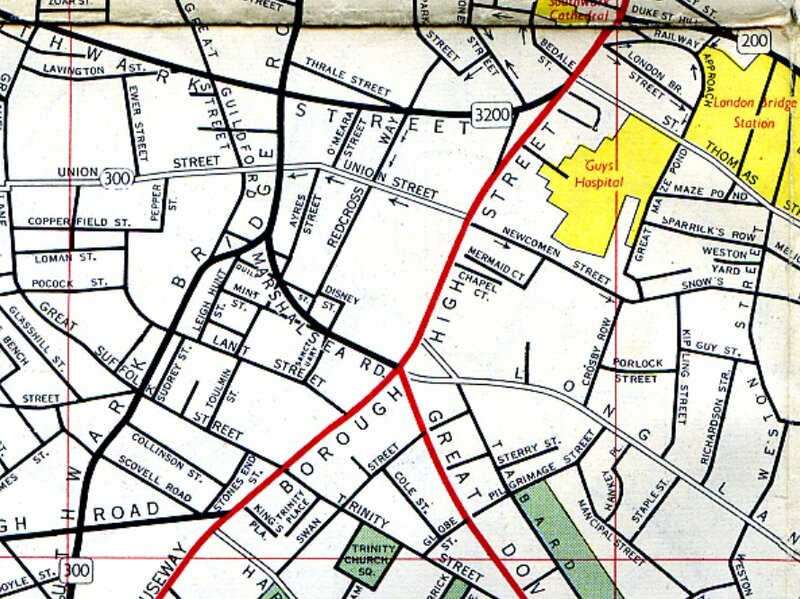 The gridlines are also broken for Farringdon Street Station, St. Bartholomew’s Hospital, and the GPO. Charterhouse Street shows a mixture of feature masking and character spacing to fit the label in. In example 6, the street labels mostly have extra spacing between words so the two parts of the name line up across the terraces. Other streets have spacing between characters to fill the feature, as above. The U of Queensbridge Road seems to have fallen in the canal though, which is a bit unfortunate. Lots of character spacing in example 7, especially Leonard Street and Epworth Street, and lots of labels in spaces, especially City Road. 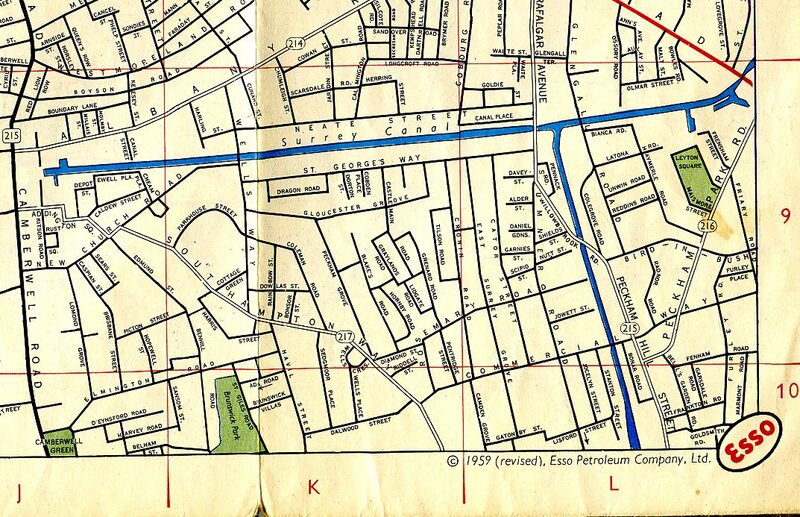 And in the last example, we can see the date of the map, 1959. 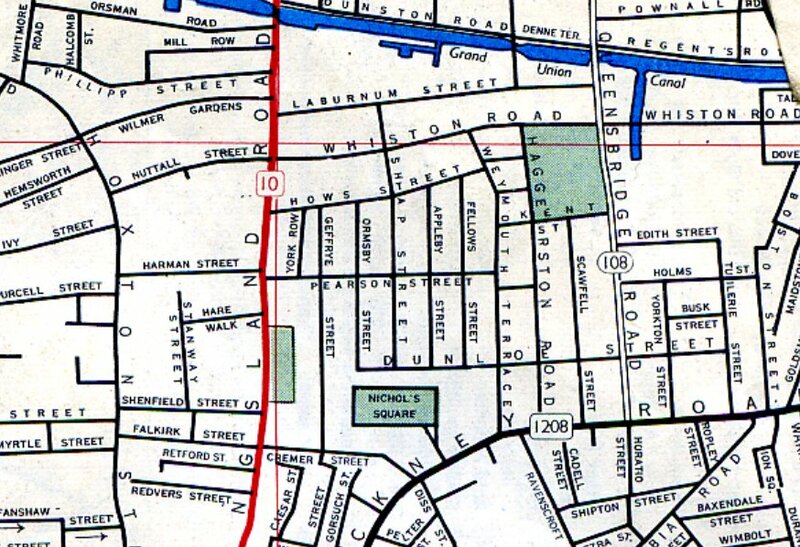 Also of interest in this corner is the Surrey Canal – I didn’t know there was a canal running through the middle of Camberwell. Unfortunately, it has now been filled in and forms part of Burgess Park. This blog offers more detail and laments what could have been had gentrification reached this part of town a bit sooner. 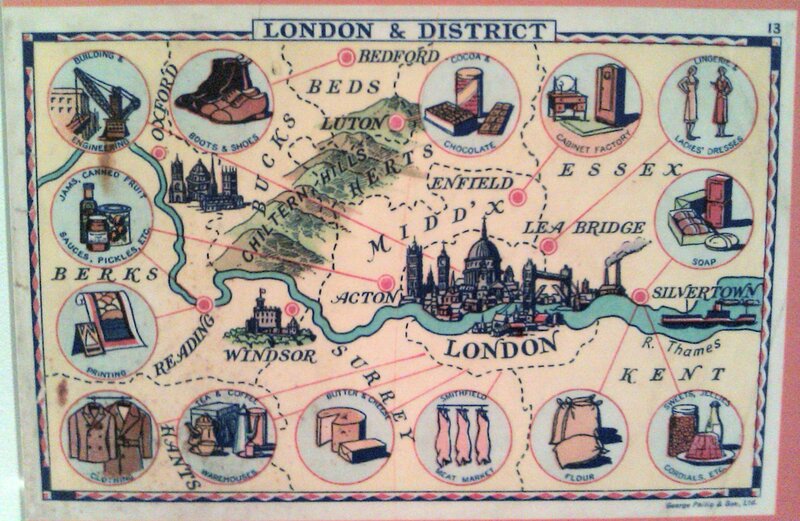 On the reverse of the map, the whole of Greater London is shown at a smaller scale. 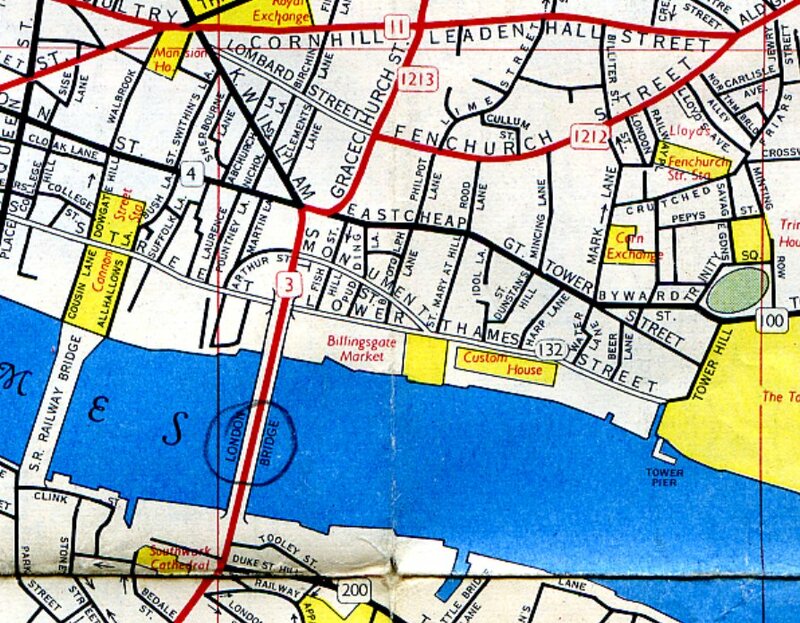 It’s not as interesting as the street-level map, so I’ve just included a view of how the docks and Greenwich looked in 1959. 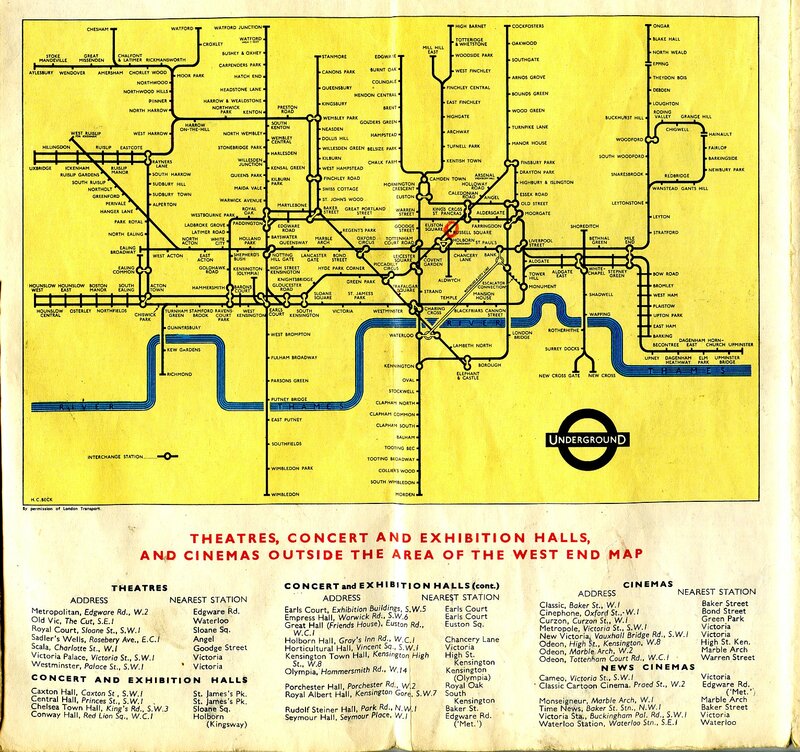 The last item of interest here is a tube map by one H. C. Beck. It looks quite different to modern tube maps, with fewer diagonals and station names fully capitalised. A quick look on the London Tube Map Archive shows it to be a monochrome version of the 1958 edition. Last week I took the kids to Touchstones museum in Rochdale, where amongst the exhibits on crossing the Pennines by foot/horse/canal/train/car, sending children to work in the mines, and famous Rochdalians (Gracie Fields, John Bright, err.. and some others), I saw these maps, taken from a Co-operative Wholesale Society booklet. Rochdale is, after all, the birthplace of the international Co-operative movement (although not according to some). Apologies for picture quality, by the way. I was hoping I could buy these as postcards in the museum shop, but they weren’t there. Phonecam images will have to do. 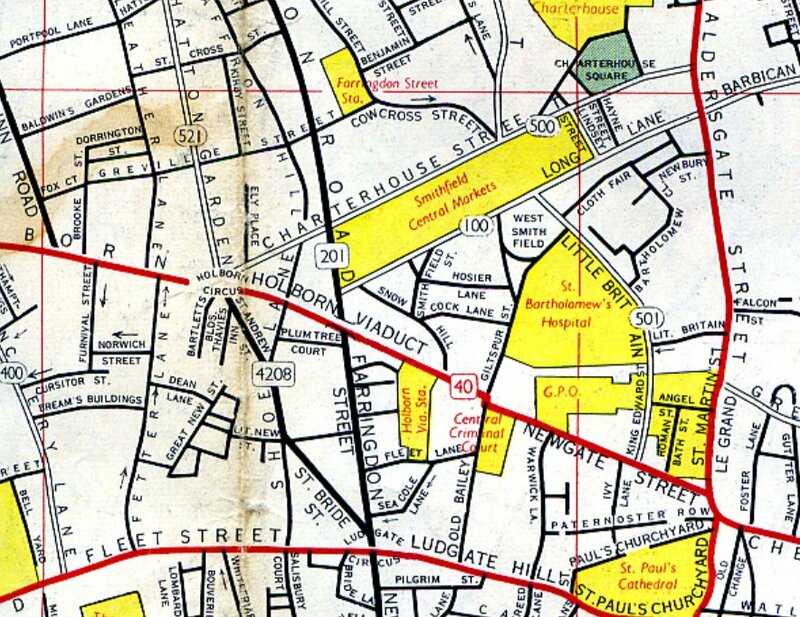 The first map shows Manchester, which, as we all know, is the centre of the universe, or it seems to be here at least. That great symbol of Mancunian stubbornness, the Manchester Ship Canal is shown, and I like how the label is written on the warehouses along the south bank of the canal, rather than trying to squeeze it onto the water. You can also see a steam train leaving the city, probably to symbolise the oldest passenger railway in the world. 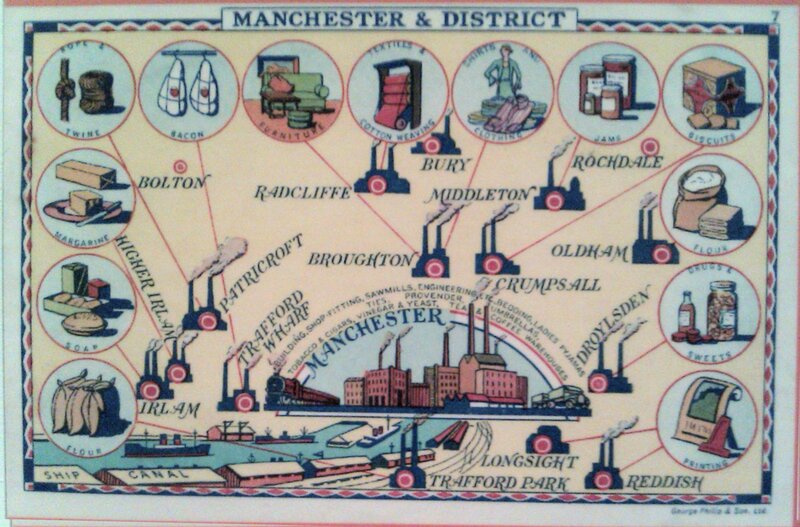 I wasn’t sure whether the goods and services pictured around the edge of the map are particular to the towns they are connected to, or just a way to add a bit of interest to the design, but it turns out that Crumpsall is famous for its biscuits, people travel from miles around to see the famous Patricroft rope and twine, and Longsight appears to be the centre of CWS’s printing operation. I don’t think textiles and cotton weaving are restricted to Radcliffe though, they were prevalent throughout the whole area – Manchester wasn’t called Cottonopolis for nothing. 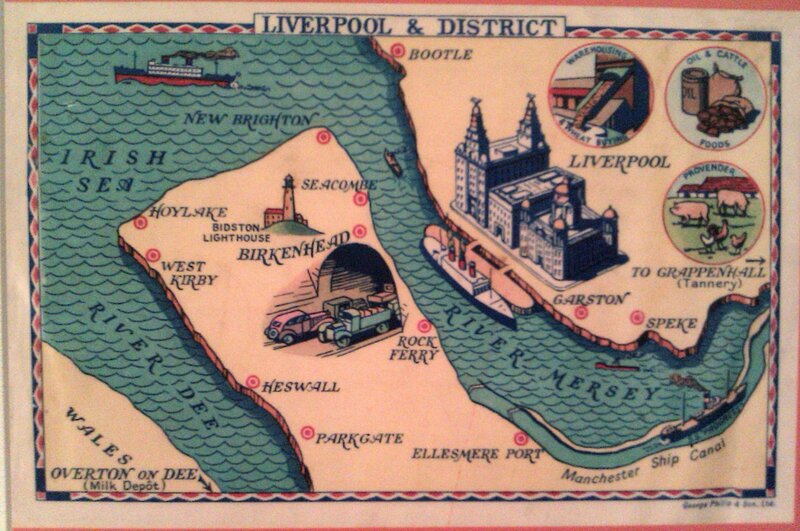 The next map shows the port of Liverpool and The Wirral, though the latter is notable only for a lighthouse and a tunnel leading to the big city (nowadays, it’s all golf courses and Premier League footballers). The sea has been painstakingly filled with a nice wave pattern – distinguishing it from the freshwater rivers and canals. There is not much else of interest shown here, apart from the Liver Building, some warehouses and goods, and the mouth of the ship canal. 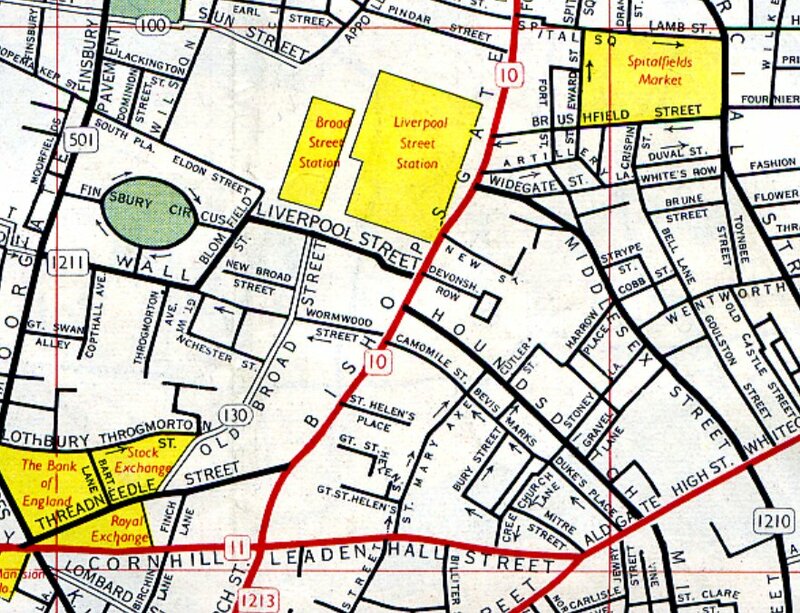 Perhaps, given the Co-op’s Lancastrian roots, and the long-running antipathy between Manchester and Liverpool, this area was deemed less important. London: I remember when it was all fields around here. I couldn’t find a date on any of these pictures, but the cars in the Birkenhead tunnel look mid-20th century – late enough, certainly, for London to be more than a small cluster of buildings around St. Paul’s. Enfield, Lea Bridge, and Acton are marked as separate towns, though they are well within the Greater London conurbation nowadays. I consider everything within the M25 as “London” (though my parents, in Epsom, don’t get to vote for the mayor, so this isn’t strictly true), and these three places are all about half way out. Silvertown, a short distance down the Thames, is home to the Tate & Lyle sugar works, the City of London airport, and the Thames barrier. It is also well within the M25, so definitely counts. Also shown are the CWS Reading print shop, boots from Bedford, chocolate from Luton, and non-Co-op-related tourist destinations Oxford (represented by Christ Church college, the Radcliffe Camera library, and A.N. Other dreaming spire), Windsor (whence came the less German-sounding name of our royal family) and the Chiltern Hills. 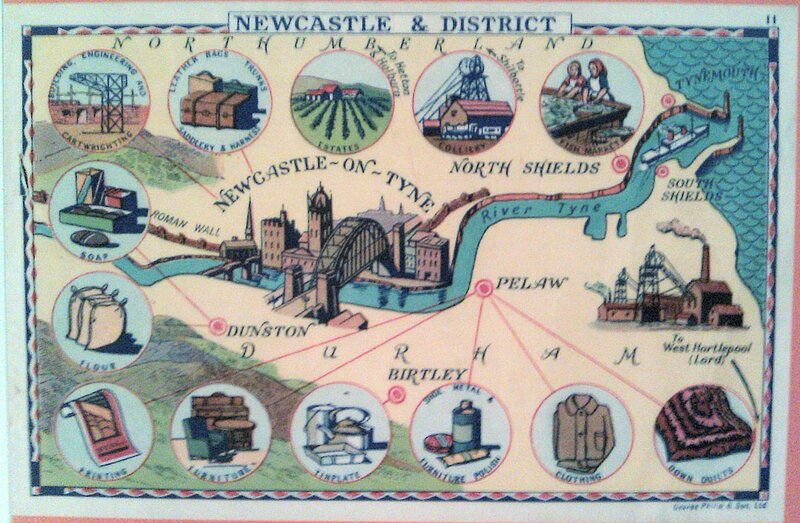 Finally, on to Newcastle, or, to be more precise, Pelaw, as most of the Co-op’s business seems to take place there. Also in the region: coal mining, North Shields fish market, cranemaking, and estates at Hetton & Holburn (not a vineyard as it looks like in the picture, but a farm estate). Local landmarks include the Tyne Bridge, and Hadrian’s Wall, which is shown passing through the city to its starting point at Wallsend. I couldn’t tell how old these images were – they seem to belong in the heart of the industrial revolution, with all the steam trains, smoking chimneys, and warehouses, although the newfangled automobiles suggest they are more modern. Maybe they are supposed to be somewhat timeless, covering the entire history of an international organisation on the move.